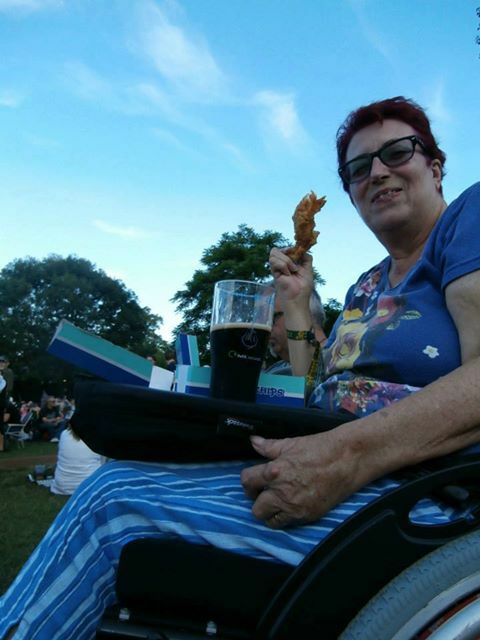 As a wheelchair user you are probably more than aware of the problem of eating when out and about. In restaurants, pubs and cafes it can be very difficult to find an accessible table or surface that you can close enough to to eat from. It isn’t easy to eat without a level surface to rest things on. Unfortunately many pubs, cafes and eating places forget that at least one table should be slightly higher to make it easy for a wheelchair and powerchair user to get right underneath. The only available tables are upstairs and there’s no lift. The only free table is at the back of a crowded restaurant and you don’t fancy battling through! These common problems are encountered daily all over the world by wheelchair users but they can be solved simply with the aid of a Trabasack. Trabasack was designed by a wheelchair user (Clare Edwards, as pictured) and has won many awards for it’s stylish design and functional ‘Design-for-all’ concept. Used as a wheelchair food tray it is a great way dining out conveniently and comfortably, so that you can get on with life, despite the negligence of cafe and restaurant owners who should provide better access! With a Trabasack food tray comfortably eat or drink from your tray on your lap without having to worry about finding a table or fitting under a table with your friends or family. You can be attend social events without the worry that you will not be able to reach or get under a suitable table. You are able to attend and eat your meal or enjoy your drinks from the stylish, ease of your Trabasack food tray. Previous to using your Trabasack, the danger of scalds and burns was much higher as drinking a hot coffee or eating a hot meal without a proper surface to rest it on is extremely dangerous but by using your Trabasack, you can rest your drink or food as and when you need to. It has a small bean bag inside it that makes it level and stable on your lap as well a purpose designed PVC tray top surface for food and hot drinks. It can also be carried and used as bag. There is room inside the bag space for preferred cups, water bottle, cutlery or splints – anything that you like to carry to make eating out easier. Using your Trabasack as an innovative wheelchair food tray is a great way of eating out socially or eating whilst on to go. On YouTube you’ll find a video from Dr. Mark Edworthy who was one of our first customers to buy the Trabasack back in 2009. In this video Mark discusses exactly how useful his Trabasack has been and exactly why he “would be lost without it”. The Trabasack is an inventive and original lap tray which doubles as a bag and has become extremely popular amongst wheelchair users for a number of reasons. Mark describes the Trabasack as “unique” and says he’d “never seen anything like it” and also has found it “incredibly useful” in the two years he’s had it. With its multifunctional use as both a tray and a bag Dr. Mark describes the surface as “beautifully flat…which I can use for writing or even put a mug of coffee on” and also notes it has “proved to be pretty indestructible for the two years I’ve had it.” This is a great testament as Trabasack’s truly are designed to last and if yours does need a wash, you can simply put it in a regular machine at 30 degrees and it’ll come out as good as new. As a wheelchair user, Dr. Mark explains how he can use the extra straps of the Trabasack to attach it to his chair when travelling and then when getting on and off trains via ramps he does not have to worry about it sliding off or getting lost. Throughout his travels Mark uses his Trabasack to carry his laptop and notes and finds it “quick to access” due to its “easy to use zips”. Fascinatingly, Mark has found another use for his Trabasack over the years, one which we may not have envisaged previously. He discusses the common problem of going out to eat in restaurants as a wheelchair user and how many restaurants simply aren’t designed with accessibility in mind. However with your Trabasack in tow, Mark explains how you “can put the plate straight onto the Trabasack, no fuss, simplicity”. Dr Mark considers his Trabasack essential and as mentioned says “I would be lost without it” which is a true sign of exactly how useful and valuable your Trabasack will become once you’ve bought it.